People are supposedly driven by only 2 things: our attraction to pleasure and our fear of pain. Sadly, the fear of pain is usually the stronger of the two. Which means, we’ll work harder to avoid pain than we will to gain pleasure. These are big, broad and sweeping generalizations that can encompass many things. For CEOs and business owners, the desire to grow the business means we generate more revenue, which means we generate greater profits, which means we reap bigger financial rewards. Hello, Pleasure. It may also mean we work hard to avoid hitting a sales slump because that brings with it a slower flow of cash, more restricted resources (aka cash) and the risk of losing our business if it continues. Some people claim to have a fear of failure while others vow they’re more afraid of success. I’m not quite sure about all that, but I’ve come to believe that these 2 reasons – pleasure and pain – are likely at the heart of every motivation we’ve got. Professionally and personally. Pain, and the avoidance of it, maybe among failure’s strongest weapons. But it’s inevitable. If we press on we’re going to experience pain. It’s a given. And only a matter of time. Pleasure and the pursuit of it are often very temporary. We hit a certain sales goal only to realize we now must chase something higher in order to feel good about ourselves, and our company. Such is life. A short time ago I began to help a friend out with some live streaming. Miguel Dias operates ScaleupAcademy.io. He’s in Portugal and wanted to start a new live streaming show, Scaleup Heroes. It’s the first European live show on scaling up a company (for instance, growing a company from $10M to $100M). As companies scale up they encounter new challenges and new opportunities. What once worked, may stop working. Companies, including their C-Suite leaders, must learn along the way so they can continue to grow. These are especially true for European companies where markets may be much smaller than here in America. The interesting thing I’ve found as I’ve interacted with a variety of business people from Europe is that a common problem continues to resurface. Communication. And along with it, culture. And each person readily admits that intentional incorporation of diversity is not just important, but urgent. Companies devoted to growth and scaling up are finding that diversity is crucial as they continue to innovate. It’s also how communication and culture can best be improved. Companies intent on scaling up are searching for the pleasure of success – higher revenues, more customers, more resources and bigger profits. Simultaneously, they’re working hard to avoid the pain of losing in the market. Fear of lower sales, laying off employees and potentially closing their doors are all daily drivers behind their decisions. It doesn’t matter where we are – North America or Europe. Our desires and fears are common. Ditto with our problems and challenges. Not necessarily true with our opportunities, but we’ve got plenty of those, too. CEOs and business owners are by nature stubborn. We have to be. Our stubbornness helps us succeed. And overcome all the adversity. But we’re all different. I suppose some of us pursue the pleasures of success and achievement more than we pursue escaping pain, but every CEO and business owner I’ve ever known has a healthy drive regarding them both. From engineering to marketing to sales to top-level leadership…that diversity issue comes up over and over again. People in every area of a company can speak to how valuable it is when we’re talking about communication, culture, and INNOVATION. Fact is, growth, improvement and transformation are especially important in the C-Suite. And that’s where those things are often most lacking. Because it’s so easy to be complacent. It’s easy for top-level leaders to grow comfortable with themselves. No, rarely will we be comfortable with the performance of our people, or with whatever success we’ve achieved. But we can reach a point in our lives where we just want to avoid any fear of pain. Life is good, and so our attraction to pleasure may remain fairly constant. Taking chances isn’t something we’re likely to embrace though — because that would mean change. Most of us hate change! That’s why we continue to do what we’ve always done. Our meetings this week look and feel just like the ones we had last week. And last month. The way we approach challenges and opportunities hasn’t likely changed in a long time. We’ve found a rhythm and formula that worked, and we stick with it. No matter that it’s not working as well as it once did. It’s still comfortable for us. So we stay the course. Mostly, because it’s what we know. Okay, so we’re all chasing pleasure and hoping to avoid pain. That’s precisely why we get stuck! Comfortable with whatever level of pleasure we’ve achieved. Comfortable with avoiding serious pain. You’re constantly looking at the performance of your people, especially your direct reports. Sometimes you know you’re judging them more harshly than they even deserve. But you figure it’s your job. You’re the boss. You can make it be however you want it to be. Ownership has its priveledges. I’m asking you to take a moment to exam yourself. Don’t think about your team. Just think of yourself as the CEO or owner. What’s holding you back? 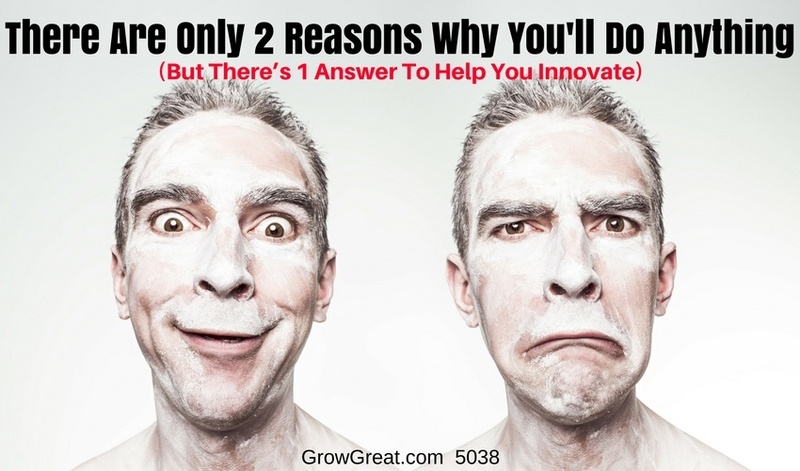 Why haven’t you innovated in your own work? Are you still doing what you’ve always done? In much the same way? Are you stuck? Listen, sometimes we get stuck in some pretty good places, but we’re still stuck. Being stuck in a pretty good place may be the most dangerous place of all because it makes us vulnerable. Susceptible to a big loss. Open to attack. Complacency is always dangerous. Sometimes we need a jolt, but we don’t want a jolt. Sometimes we just stay the course until or unless something forces a change. But we’re the number 1. We should be pushing ourselves. Welcome to the human race. CEOs and owners aren’t exempt from being comfortable, even if we know (deep down) that we’re hiding or avoiding necessary improvements. Diversity may provide some insightful answers. We’re listening to the same voices. Reading the same trades. Following industry trends. All things remain as they’ve always remained. This rut we’re in is liable to become our grave if we’re not careful. Maybe it’s time to expand our outlook. Maybe it’s time to get some different perspectives and viewpoints. If only to debate what we assume is true. And to have people challenge us in all the best ways. We’re busy pushing people and our business. We’re constantly urging people to grow and improve. What about us? What’s stopping us from doing the same thing? Will you look back and wonder why you didn’t foster these same things in yourself and your leadership?